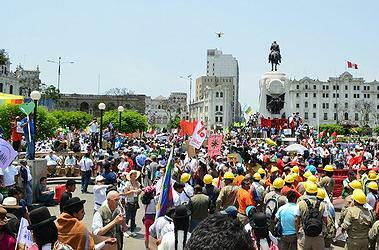 LIMA, Peru, December 11, 2014 (ENS) – Urging “Climate Justice Now!” an estimated 20,000 people took over the streets of Lima Wednesday for the People’s Climate March. Their goal – to inject a sense of urgency into slow-moving government negotiations on a new universal, legally-binding climate change agreement to take effect in 2020. World leaders Wednesday opened the high-level segment of the United Nations climate summit, underway in a former military compound once used to torture detainees. Leaders of 196 governments are at the UN Climate Change Conference, known also as COP20, the 20th session of the Conference of the Parties to the UN Framework Convention on Climate Change, UNFCCC. Out on the streets, local trade unions, women’s groups and student associations were joined by campesino and indigenous peoples from across Peru to highlight the devastating impact that climate change is already having on food and water in the country. 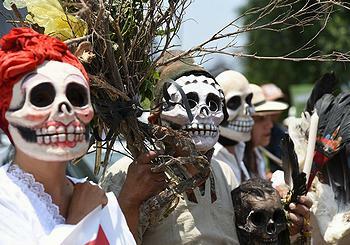 Playing drums and horns, wearing traditional garb, carrying flags and banners urging climate protection in Spanish and English, people of all ages demanded action from world leaders. Peruvian organizations took advantage of the international attention focused on Lima this week to protest recent changes to Peru’s environmental laws that have weakened planning controls and restrict protest rights. International activists walked in solidarity with the locally organized People’s Climate March, reinforcing demands for climate justice. “The demand of this march is not a deal at the UN, but a deal at the UN that actually includes the rights and needs of impacted people. If there is no justice, there is no deal,” said Dipti Bhatnagar, coordinator for climate justice and energy at Friends of the Earth International. Inside the official UN venue, Lidy Nacpil, a leader of Jubilee South Asia Pacific in the Philippines, made a joint presentation to the ministers on behalf of registered observers from trade unions, environmental NGOs, womens’ groups and youth groups. 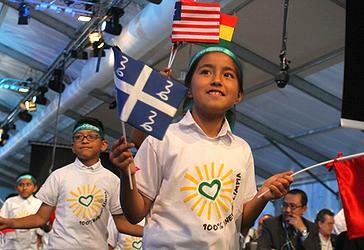 As world leaders arrived for the opening of the high-level segment of the talks, 100 children entered the conference venue to deliver a 2.2-million strong petition calling for 100 percent clean energy. But some governments are obstructing agreement. 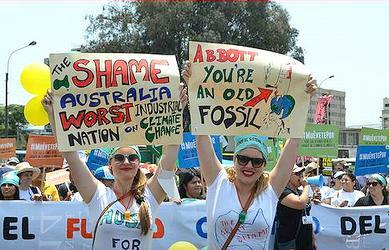 Australia’s Greens say their coal-producing country is the “chief obstructer” at the talks. The more action that is taken today on climate change, the more likely it is that countries will push for stronger agreements tomorrow, UN Secretary-General Ban Ki-moon told a high-level meeting at the conference today. “The more we delay, the more we will pay,” warned Ban as he called on countries to deliver by closing tomorrow a draft text for the 2015 agreement that provides a clear and solid foundation for negotiations to be held next year in France. “Actions now will set a strong foundation for Paris, and go hand-in-hand with our efforts to realize sustainable development,” Ban said..
COP20, which opened on December 1 in Lima, brings together the 196 Parties to the UNFCCC, the parent treaty of the landmark 1997 Kyoto Protocol, in an attempt to hammer out the new universal treaty, which would enter force by 2020. Reiterating that climate action and sustainable development are “two sides of the same coin,” Ban urged governments to act to keep average global temperature rise below 2ºCelsius compared to pre-industrial times. This internationally-agreed limit is supposed to avert the worst consequences of climate change. “We have been talking over the last two decades. Now it is time to begin real, serious negotiations based on a draft text,” the secretary-general said. The UN talks in Lima are scheduled to conclude on Friday, but could spill over into further talks on Saturday as negotiators reach for consensus on the draft agreement to be finalized in Paris next year.